Enjoy our 18 holes framed by the beautiful lakes Nahuel Huapi and Moreno, mountains, centennial forests of cypress and cohiues (local trees). 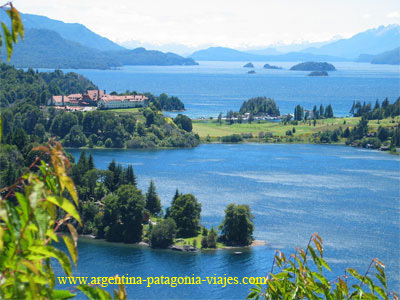 Live an unforgettable experience in the Nahuel Huapi National Park, in the heart of Patagonia - Argentina. Our 18 holes golf course is unique and it matches the best golf courses in the world. The Hotel has 147 double rooms, 11 suites and 1 cabin. For family groups, we have connecting or adjacent rooms. All rooms are equipped with Telephone, cable TV, safety box, minibar, Valet and laundry services. There is always a possibility of taking golf classes, playing tournaments or renting clubs. A great advantage: absolute silence for the best concentration.